Shipping on all orders just �to anywhere in the world. Please let me know at bigclive1@gmail.com if you have any problems using this shop. Note that on some browsers the Paypal shopping cart opens in another tab. When you press a buy button it updates the cart in the other tab. Really nice little PCBs that can be used to make LED flowers with nothing more than six LEDs, two 330 ohm resistors and a 12V power supply. Perfect for making LED bonsai trees or just a futuristic indoor garden. 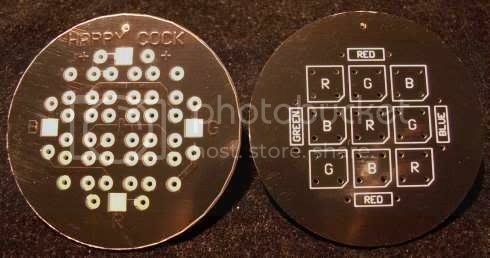 These are bare PCBs so you can use your own choice of LED colour. See the assembly video on YouTube. A PCB that forms the basis of a decorative LED light that emulates the appearance of a snowdrop flower. 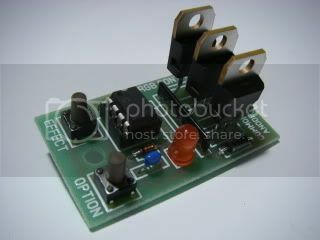 Available individually as a blank PCB for �50 each. No other programming equipment is needed to set this controller up. All software is already on-board! This is a professional controller designed for stand-alone use. It has more effects than the mini controller and an architectural mode which locks out the strobing and flashing effects. This module differs greatly from other controllers that have fixed repetitive patterns in that it uses an eight million bit randomiser to give near infinite variety with 16 million colours, and stores your last setting to non volatile memory so that the unit always powers up in the last selected mode. 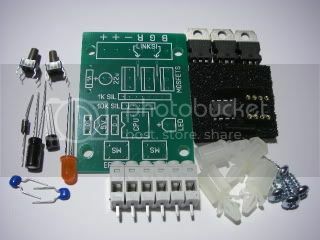 This kit of parts includes professional rising clamp terminals, a gold insert IC socket, programmed microcontroller, chunky MOSFETs rated to handle about 5A (5000mA) each and mounting hardware. Output is full 8-bit 256 step resolution on each channel at approximately 350Hz. This kit is used extensively around the world in theme parks, architectural features, fountains, sculptures, trucks, cruise ships, rides, bars, moodlights, clubs and many other applications. A knob based RGB controller kit for colour mixing with LEDs. This kit is different from the other controllers in that it uses a single knob to choose colours and enable the automatic modes. I've upgraded the software for this dramatically. It can now access variable colour temperature white with the knob, has a calibration mode to match red, green and blue intensities, has a "favourite colour" mode which can recall a programmed (full spectrum colour) with a single press of the knob and has two automatic modes which pick colours randomly (solid or full spectrum) and gently fade between them, pausing on each one momentarily. Once again everything is done in gentle sweeps, and the unit remembers the last mode it was in even when tuned off. All the features you'd want in a basic architectural lighting controller. A compact RGB controller kit that has a reduced number of effects, but still uses an 8 million bit randomiser to select from over 16 million colours and has a multitude of really smart effects unmatched by any other controller anywhere near this price. It can sink up to 5000mA (5A) per channel and is designed to run from a 10 to 15V supply. Can be upgraded with the PRO RGB chip to give it the full features of the pro controller. Click here to see it's list of effects. Get some cheap LEDs at Phenoptix.com. An excellent PCB that is designed to fit into a standard 150W halogen floodlight case. It can either accommodate 18 each of red, green and blue superflux LEDs (3 or 5mm lens) for colour mixing with RGB controllers (including the ones above), or 54 of a single colour. Other applications include low energy (solar) lighting, vehicle lighting, emergency lighting, outdoor lighting, Christmas lighting or Hydroponic red/blue grow lights. An all green version looks fantastic for spooky halloween FX! 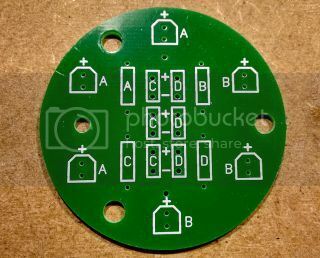 A very nice PCB designed to fit into standard MR16 downlight frames (12V 50W downlights). 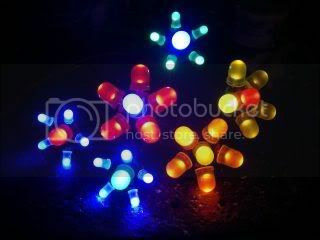 It is designed to take nine superflux 4-pin LEDs (3 or 5mm lens) with either three of each colour for RGB colour mixing, a cluster of nine of a single colour or even a random combination as you please (red and blue mix looks good). 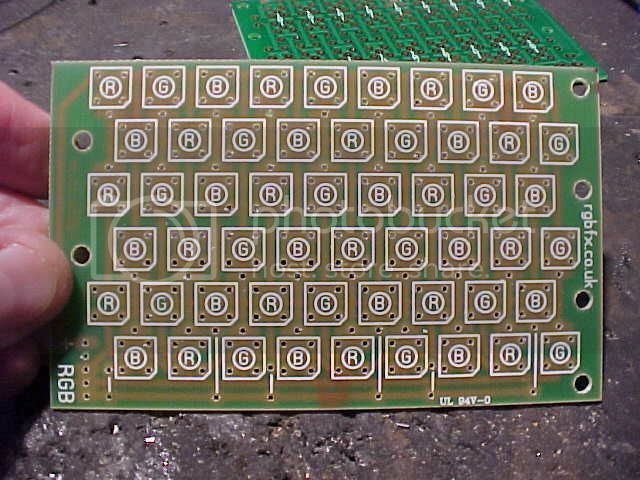 The board has four resistor positions with one each for the green and blue circuits and two in series for the red circuit to spread the heat dissipation due to the lower forward voltage of reds. 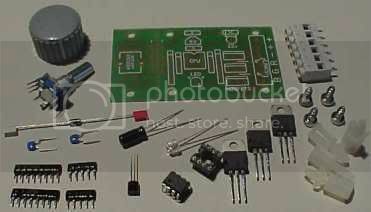 The board is manufactured in FR4 and is ROHS compliant. There are four pads on the back for wire connection R,G,B and +. For single colour use just bridge the R,G & B together. 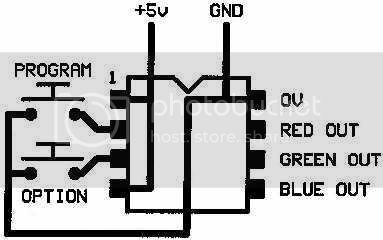 Each channel has three LEDs in series and the PCB is designed for use at 12V. The chip used in the Pro RGB controller. Ideal for building into your own projects or using to upgrade the mini RGB controller. We custom wrote this software ourselves. It is not available elsewhere. The new software for the knob controller (already included with new kits) that adds variable colour temperature white into the colour range, allows calibration of the red, green and blue intensities for perfect white, lets you choose a favourite colour for instant access at a single press, has two automatic modes, one with bold colours and one with full spectrum colours and last but not least, a facility to set all parameters to their defaults. As before, the last mode is always remembered for power-up. Shipping on all orders just 2 UKP to anywhere in the world. Back to "Things to make and do."